WINNER of the AFTA 2018 apparel category the Samaki Black Marlin Shirt offers the ultimate for marlin anglers. It is a detailed design, with stripes riding the spine of the marlin, a subtle hit of gold running down the body, the game boat outriggers in the distance and that deep blue of warm water throughout out the base. The lightweight fabric is perfect for all outdoor elements, protecting you from the harsh sunrays with our UV50+ resistant technology. According to the manufacturers, the soft touch 100% polyester material is comfortable on the body plus has the added feature of being breathable keeping you cool and dry. 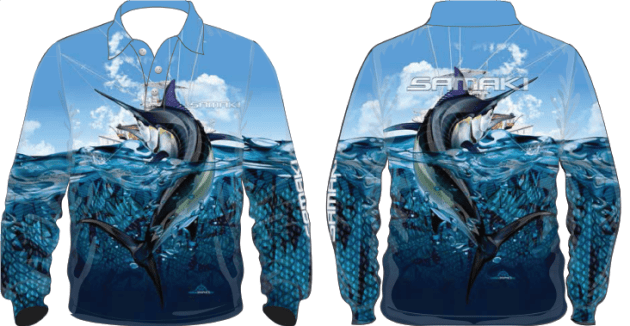 The Samaki Black Marlin Shirt is designed by Australian anglers and are available in adult, youth and kids sizes from a size 2 through to a 3XL. The RRP is $59.95 for adults and $49.95 for youth and kids. For more information and stockists visit www.samaki.com.au.